Torch Lake Sandy Bottom Sunset Living in Downtown Alden with your own tennis court and swim spa! 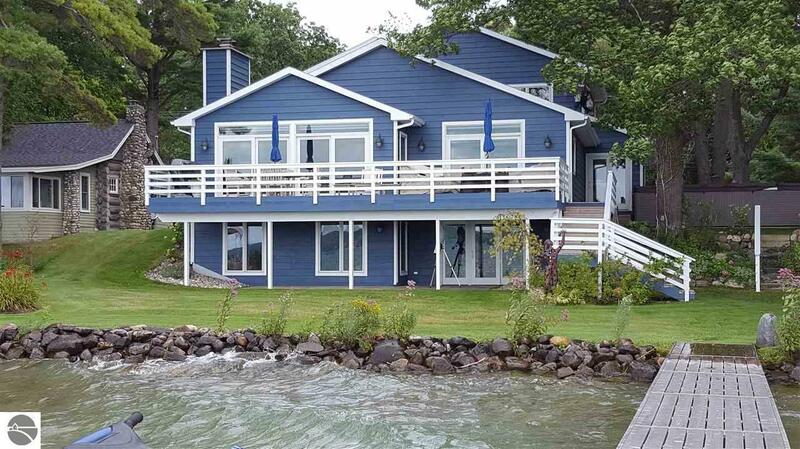 This Craftsman style waterfront home has been meticulously maintained inside and out. The home features a wonderful custom kitchen with granite counters, oak cabinetry & Pewabic tile back splashes, Wolf convection wall ovens, Electrolux refrigerator & freezer and Bosch dishwasher. Enjoy meals from a wonderful lakeside formal dining area, living room with electric blinds, gas fireplace outlined with Pewabic tiles, vaulted ceilings and built in granite dry bar and 1/2 bath. Large main floor master bedroom with its own custom private master bath. Two large additional bedrooms and a full bath on the 2nd floor. The lower level is perfect for lakefront indoor entertaining with access to the concrete lakefront patio, 4th bedroom or office/exercise room, waterfront bar. 900 sq ft lakeside deck, Generac house generator, Rainwise weather station, central A/C, dock and large finished, insulated and heated 3 car garage all this with a path through your property to your very own regulation size-fenced in tennis court. Fam Rm Size: 28' 1" x 25' 6"
Kit Size: 16' 2" x 12' 7"
Liv Rm Size: 20' 8" x 25' 3"